What was that bulbous-looking car that whisked Pope Francis away from the tarmac on Tuesday? A Fiat 500L by Fiat Chrysler Automobiles. In fact, the Pope is making good use of Fiat Chrysler wheels on his visit to the United States. The 500L is big brother to the more familiar Fiat 500 mini car. Prices start at about $20,000. 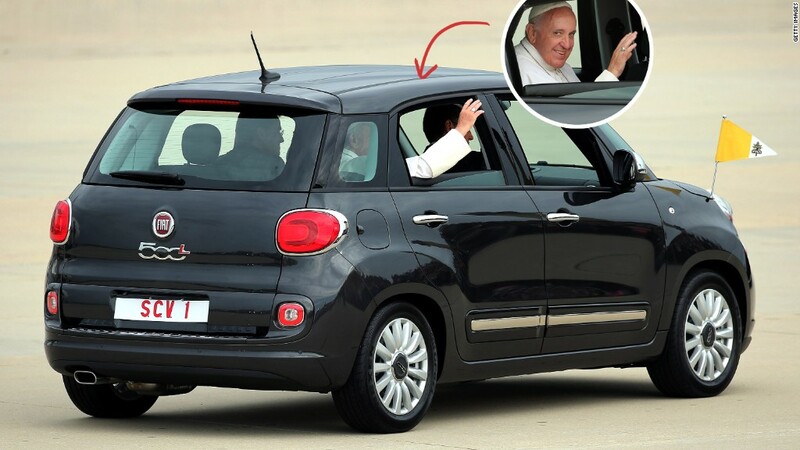 Unlike the Fiat 500, which would have been entirely impractical for transporting a Pope and his entourage, the 500L is large and roomy inside. The Fiat 500L is about two feet longer and six inches taller than the ordinary Fiat 500, and it has 3.5 inches more rear seat legroom and a good four inches more headroom. It can seat five -- although not too comfortably -- and four easily. On the other hand, the Fiat 500 is limited to, at most, four and definitely not comfortably. The 500L is ideal transport for a frugal Pope who likes to keep fuss and luxuries to a minimum. When visiting other countries, he has taken compact cars like the Ford Focus. The Fiat 500L is a considerably more comfortable choice. It's not particularly fun to drive, given its tendency to wobble in hard turns. 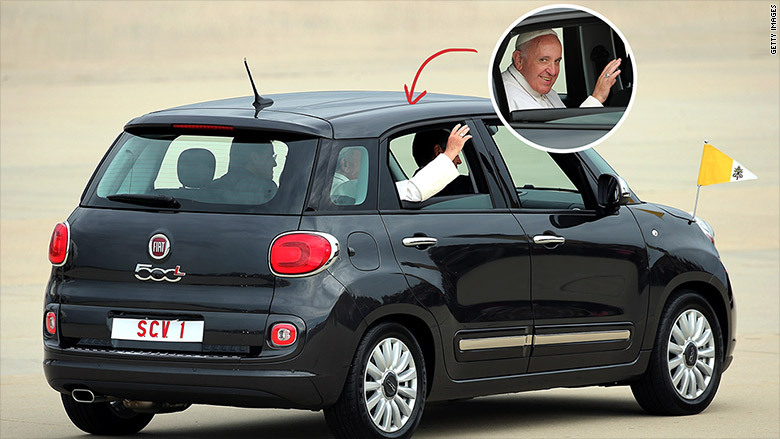 But that's not what the 500L is about -- nor, really, is Pope Francis. You don't see the 500L often because it's Fiat's slowest-selling model behind the 500 and now the new Fiat 500X, a sportier crossover SUV with available all-wheel-drive. In parades, Pope Francis will be riding in a modified Jeep Wrangler, also a product of the Fiat Chrysler (FCAM)company. The Wrangler, with its open top, will allow him to be easily seen by crowds. In other countries, he has used SUVs, like the Hyunda Santa Fe, that have been modified, with part of the roof cut away. No need for that with the Wrangler. Again, simple and no fuss.